Mass Alliance of HUD Tenants (MAHT) spearheads campaign for City Vouchers to save our homes! In response to Boston’s growing housing and homelessness crisis, MAHT is spearheading a broad coalition of housing and community groups to propose a city-funded voucher program. The program would provide “Housing First” for people experiencing homelessness in Boston and low income renters facing displacement. The City of Washington, DC, currently funds 3,248 Vouchers from the City’s budget. If they can do it, why can’t we? Following a Boston City Council hearing on March 21, nine councilors, led by Council President Wu and Housing Chair Zakim, wrote Mayor Walsh to urge inclusion of $5 million in the budget to provide “Housing First” Vouchers for 350 individual residents and families in Boston. Coalition pre-meeting in the Curley Room. Meeting with the Mayor in his conference room. Mel King made an impassioned appeal for the voucher program. In June, a delegation led by MAHT and allies including the Save Our Section 8 Committee, Boston Homeless Solidarity Committee, and Mel King, met with the Mayor to urge his support for the Councilors’ proposed pilot program (meeting photos above). The Mayor declined, but promised to meet with the coalition again and consider City funded Vouchers next year, if a stable revenue source can be identified. If Boston voters approve the Community Preservation Act (CPA) on the ballot in November, Boston could have up to $15 million available each year to pay for up to 1,000 City funded vouchers. MAHT is an active member of Yes for a Better Boston, working to pass the CPA. MAHT is planning to door knock 6,000 HUD tenant households to pass the CPA and sign a postcard to the Mayor urging support for the Voucher plan. Join us in that effort! Photo on front page: Protesters demonstrate as part of MAHT save-our-homes campaign for City Vouchers to rescue public housing from demolition and prevent the forced eviction of residents. 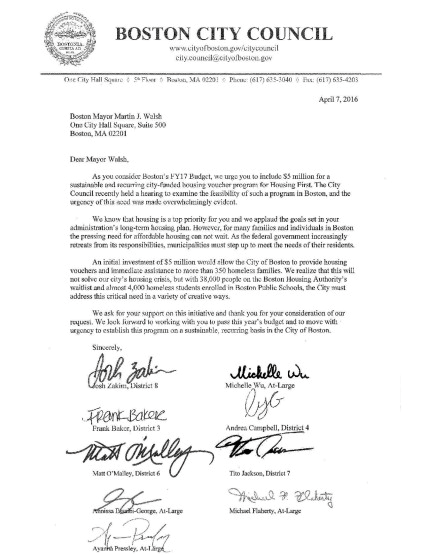 Image on this page: The efforts of MASS Alliance of HUD Tenants (MAHT) pay off in the form of a letter from City Council members appealing to the Mayor for a city-funded voucher program. Source: MAHT. MAHT spearheads campaign for City Vouchers to save our homes! Massachusetts Enacts Landmark Law to Stop Bullying. Join us Aug 20th: MAHT’s annual cookout and report back from the NAHT Conference. 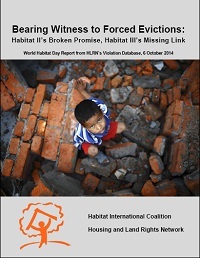 How Far ‘Out of Reach’ is Housing in MA? URGENT! ACT NOW to tell Congress to pass “clean” appropriations bills and prevent a government shutdown!